Middle to Late Holocene mobilization of DOC-bound Pb and Y in the Magellanic moorlands (53° S) as a function of sea spray fertilization, climate variations and volcanic fallout? A preliminary report Mobilization of DOC-bound Pb and Y in the Magellanic moorlands (53∘ S) Björn Klaes et al. Klaes, B., Kilian, R., Wörner, G., Thiele-Bruhn, S., and Arz, H. W.: Middle to Late Holocene mobilization of DOC-bound Pb and Y in the Magellanic moorlands (53∘ S) as a function of sea spray fertilization, climate variations and volcanic fallout? A preliminary report, E&G Quaternary Sci. J., 67, 1–6, https://doi.org/10.5194/egqsj-67-1-2018, 2018. In the course of previously reconstructed paleoclimate, the yttrium (Y) content of the MA1 stalagmite from the Marcelo Arévalo (MA) cave at 53∘ S has been used as proxy for rainfall intensity-related transport of siliciclastic detritus onto the speleothem (Schimpf et al., 2011). Due to the fact that later works (e.g., Hartland et al., 2012; Birkel et al., 2017) highlight organic complexation as the dominant transport pathway of Y and other hardly soluble trace elements in DOC-rich waters, a reconsideration of the MA1 stalagmite's Y record was necessary, including an investigation on local soil formation as well as rock weathering. In southernmost Patagonia, the Magellanic moorlands cover an extended area at the windward side of the Andes (Kilian et al., 2006; Whittle and Gallego-Sala, 2016), but pedogenetic processes of the dominantly occurring soil types in this region (Podsols and Histosols) are still poorly studied (Casanova et al., 2013). Such peatlands are one of the world's most important terrestrial carbon sinks, but they also release large amounts of dissolved organic carbon (DOC) into nearby aquatic systems (Birkel et al., 2017). Besides particulate organic carbon (POC), this flux may contribute to an organic carbon burial in fjord sediments from southernmost Patagonia that is up to hundred times higher than the global ocean average (Smith et al., 2015). DOC releases from peatland ecosystems are mainly controlled by rainfall intensity, water table fluctuations, temperature, soil pH and peat accumulation–degradation cycles (e.g., Broder et al., 2015; Birkel et al., 2017). Here, the transport of typically more insoluble trace elements, such as lead (Pb) and yttrium, is strongly linked to the solute export of carbon (Birkel et al., 2017). Due to the fact that complexation of Pb and Y in soil solutions and surface and drip waters is more susceptible to organic substances than to pedogenic (hydr)oxides, they represent suitable proxies to determine paleo-fluxes of DOC in the course of speleothem trace element analysis (e.g., Hartland et al., 2012). Sea spray has been considered as the most important nutrient source for ombrotrophic peatlands in westerly dominated coastal mountain belts, such as the superhumid southernmost Andes (Kilian et al., 2013; Whittle and Gallego-Sala, 2016), in particular during periods with an increasing strength of the southern westerly wind belt (SWW; Lamy et al., 2010). It has a significant control on peat accumulation and decomposition rates as well as on the hydrochemistry of surface waters and chemical leaching of soils and bedrock (e.g., Kilian et al., 2013; Broder et al., 2015): sea-salt aerosols introduce various basic ions, micro-nutrients and sulfate into terrestrial ecosystems. Moreover, they are suggested to be the major contributor to the natural deposition of selenium (Se) at coastal sites (Wen and Carignan, 2009). For that reason, Se concentrations in a stalagmite from the southernmost Andes have been previously used as a valuable paleoenvironmental proxy for sea spray deposition to the Magellanic moorlands (Kilian et al., 2013), especially since Se pollution by regional anthropogenic sources (e.g., industry, Wen and Carignan, 2009) is limited in such a remote study area. In soils characterized by high OC contents and acidic pore water, e.g., in peat soils, Se mobilization/immobilization is rather controlled by plant uptake and the adsorption onto organic substances than by adsorption onto Fe/Al (hydr)oxides (Li et al., 2017). Nevertheless, a certain amount of Se remains dissolved in soil solutions of acid environments (Li et al., 2017). Figure 1(a) The southernmost Patagonian Andes with the study site in the northwest of the Gran Campo Nevado ice field (GCN), the location of the Mt. Burney volcano and isolines for annual precipitation (Lamy et al., 2010). (b) The MA cave system and the associated catchment in a small bay of a fjord arm connected to the Strait of Magellan with the drainage pathways (blue arrows) and the automatic weather station (AWS) Arévalo. Previous investigations in the study area highlighted that regional climate variations (wind velocities, precipitation and temperature) during distinct Holocene phases are closely related to changes in SWW intensities (Lamy et al., 2010). Furthermore, large centennial to millennium-scale modifications of aquatic as well as terrestrial ecosystems of the superhumid southernmost Andes have been interpreted as a consequence of (1) climate variations (e.g., the global cooling-phenomena during the Little Ice Age, LIA; Schimpf et al., 2011; Kilian et al., 2013) and (2) local tephra fallout, in particular after the Plinian 4.15 kyr cal BP Mt. Burney eruption (Kilian et al., 2006). Here we present first insights into Middle to Late Holocene peat formation–degradation cycles in the Magellanic moorlands as revealed by a revaluation of trace element concentrations detected in the MA1 stalagmite, based on newly gathered Pb, Y and Se data from the MA cave's host rocks as well as distinguished soil horizons and weathered parent rocks from its peat-vegetated catchment. The MA cave from where the stalagmite MA1 has been recovered is located in the core zone of the SWW in the western Strait of Magellan (52∘41.7′ S, 73∘23.3′ W; Schimpf et al., 2011; Fig. 1a). It was formed by fjord coastal erosion in a fracture zone at 20 m a.s.l. during a period with more elevated coastlines. Next to the site, the automatic weather station Arévalo (Fig. 1b) recorded during the last decade an annual precipitation of up to 4500 mm a−1 and mean temperatures at 5.3 ∘C (Schimpf et al., 2011, and unpublished data). The small catchment (ca. 25 m × 25 m at 80 m a.s.l.) is situated on top of a relatively flat ridge (Fig. 1b), which is characterized by peat vegetation and bare rock surfaces. It is connected by drainage pathways along the fracture zone with the interior of the cave. The cave's walls and rock lithology of the catchment are composed of granitoid rocks and mylonitic orthogneiss which are cross-cut by some mafic dykes. The soils of the peat catchment (Histic Podsols, termed according to FAO, 2015) reach a solum thickness of 50 cm on average and have a sandy loam texture. Its pore water is characterized by a distinct acidity (pH between 3.9 and 5.7). Within the four soil profiles, a spodic horizon underlies the histic epipedon (ombrotrophic peat). An up to 10 cm thick tephra layer of the Mt. Burney volcano (4.15 kyr cal BP; Kilian et al., 2013) is embedded in the stagnic subsoils. The sampling position of the MA1 stalagmite inside the cave and other details of the site are described in detail by Schimpf et al. (2011). Figure 2Selenium, yttrium and lead concentrations detected in representative samples of the three different lithological features as well as of the distinguished soil horizons and Mt. Burney tephra deposits from four peat soil profiles (Histic Podsols) of the MA catchment (a, b, c). For the interpretation of the shown correlation coefficients shown in panel (c), the reader is referred to the text. 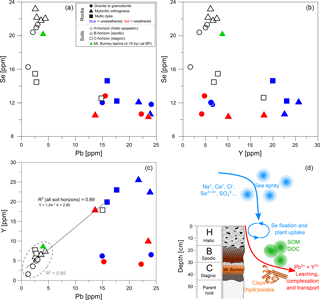 (d) The processual linkage of sea spray deposition and related fixation of selenium in ombrotrophic peat is displayed schematically in combination with leaching/transport of lead and yttrium due to podsolization (according to Wen and Carignan, 2009; Broder et al., 2015; Vermeire et al., 2016; and Li et al., 2017). A representative sampling from soil horizons and rock lithologies in and around the cave and its catchment was conducted during the austral winter expedition with RV Gran Campo II in 2015. Samples include the distinguished horizons of four peat soil profiles from the catchment, weathered rock fragments obtained from the lowermost peat soil horizons, and unweathered rocks derived from the cave's walls. Representative samples were prepared, e.g., by crushing and milling, at the Geology Department of the University of Trier. Trace element analysis (Pb, Y and Se) of pulverized bulk samples was realized with ICP-MS (Perkin Elmer DRC II Q-ICP-MS) at the Geochemistry Division of the University of Göttingen after using a ultra-pure HF/HClO4-HF/HNO3 mixture in a pressurized Teflon apparatus (Picotrace®) for acid digestion. The international standard JA-2 was applied to calibrate these ICP-MS measurements. The pH values of soil horizons were detected in CaCl2 solution using a digital pH meter at the University of Trier (Soil Science Department). Detailed information concerning previously obtained ICP-MS/OES measurements of drilled samples along the growth axis of the MA1 stalagmite as well as U/Th dating and the age–depth model has been presented in Schimpf et al. (2011). Already published trace element concentrations of the MA1 speleothem used here are Y, Se and U (Schimpf et al., 2011; Kilian et al., 2013). As shown in Fig. 2a and b the majority of upper soil horizons from the MA catchment, including the histic epipedons (H) and the spodic mineral horizons (B), show up to 2 times higher Se concentrations than underlying unaltered parent rocks (between 16 and 23 ppm). This indicates that leaching of selenium from such rock sources was limited during soil formation. The significant top-to-bottom difference of Se enrichment in soils and its decoupling from lithogenic Se budgets suggests that the deposition by sea-salt aerosols to the ombrotrophic peat of the H horizon represent an important Se source (Wen and Carignan, 2009; Broder et al., 2015), especially during frequent storm events with strong westerly winds (Lamy et al., 2010; Schimpf et al., 2011). However, the fixation of Se to organic materials and its uptake by peat vegetation seem to be an important process here, which also controls the Se retention in comparable soil types (Li et al., 2017, Fig. 2a, b and d). The high Se contents (20 ppm) detected in tephra are most likely to be explained by illuviation of Se complexed to soil organic matter (Li et al., 2017) due to prevailing podsolization processes (Vermeire et al., 2016). The vesicular structure of pumice particles promotes the accumulation of plant residuals (e.g., Hughes et al., 2013), in particular as Se in bulk samples of tephra-containing subsoils is reduced (Fig. 2a, b). In contrast to Se, the trace elements Pb and Y are mainly of a lithogenic origin and leached from source rocks (granites and granodiorite, mylonitic orthogneiss and mafic dykes; see Fig. 2a–c) as a consequence of strong mineral dissolution under acid conditions, which is a common characteristic of podsolic soils (Vermeire et al., 2016). Due to distinct host minerals (e.g., allanites for Y and certain heavy minerals for Pb; unpublished data), leaching intensities of both more lithogenic trace elements are not equal (Fig. 2a–c): in the case of Y, strongly decreased concentrations in weathered rock samples may indicate such a pronounced feedback to meteoric weathering (up to ∼ 15 ppm loss in gneisses, Fig. 2b). Furthermore, mafic dykes could represent a potential source for Y release. With regard to Pb, greater leaching tendencies can be assumed for gneisses, whereas weathered and unweathered samples of granitoid rocks exhibit a diffuse loss–gain pattern. Mafic dykes seem to be of minor importance for Pb leaching compared to that of Y (Fig. 2a, b). However, despite a possible slightly different behavior during chemical weathering in source rocks, Pb and Y show a very high correlation (R2 = 0.89 for all investigated soil horizons and R2 = 0.65 for the narrow grouped field excluding the subsoil horizon that shows elevated Y and Pb contents; Fig. 2c) with respect to their concentrations in soil horizons and tephra, which separates pedogenic processes triggered by a high OC availability from weathering of parent rocks. Both show a loss of up to ∼ 20 ppm compared to lithogenic sources. According to, for example, Hartland et al. (2012), Vermeire et al. (2016) and Birkel et al. (2017), the particular and uniform behavior of Pb and Y is controlled by a similar binding affinity to organic substances (preferred), e.g., DOC, and the formation of mineral–organic complexes with Fe/Al hydroxides (subordinate); see Fig. 2d. Consequently, it can be argued that they share the same transport mechanism in DOC-rich drainage and drip waters during their transport from the MA catchment to the MA1 speleothem. This transport mechanism and eluviation is further accelerated by the extraordinarily high precipitation. Thus, Pb and Y can be used as proxies for tracing past DOC fluxes onto the MA1 stalagmite which depend on the past climate, environmental changes and its influences on the peat ecosystem in the MA catchment as described for comparable hydrological environments (e.g., Hartland et al., 2012). The high Y content of the MA1 stalagmite (1 to 16 ppm) is most likely strongly controlled by DOC flux and only to a minor extent by the incorporation of detrital minerals in the stalagmite's laminae as previously suggested by Schimpf et al. (2011). Figure 3Middle to Late Holocene variations of element concentrations recorded by the MA1 stalagmite in combination with distinct climate phases (Lamy et al., 2010) and the 4.15 kyr cal BP Mt. Burney tephra fallout (Kilian et al., 2006). (a) Lead and yttrium (Schimpf et al., 2011) records as proxies for DOC-bound transport (e.g., Hartland et al., 2012). (b) Sea spray deposition to the site as indicated by variations of selenium concentrations (Kilian et al., 2013). (c) 10Be-based total solar irradiance (Fröhlich, 2009). (d) Intensity of chemical leaching depicted by uranium concentrations (Schimpf et al., 2011) and the Al ∕ K ratio according to Miriyala et al. (2017). The MA1 stalagmite record presented in Fig. 3a shows that the concentrations of DOC-bound Pb and Y are highly correlated during the last four millennia since the 4.15 kyr cal BP Mt. Burney eruption (R2 = 0.91; up to 16 ppm Y and up to 9 ppm Pb were measured). In particular, during an assumed warmer and more humid phase between 2.5 and 0.7 kyr BP (e.g., Lamy et al., 2010) with an estimated annual mean precipitation of up to 6500 mm a−1 for the cave site (Schimpf et al., 2011), the trace elements Pb and Y show generally increasing concentrations in the MA1 stalagmite, but also pronounced centennial-scale variations following a significant millennium-scale decline since the Mt. Burney tephra fallout (Kilian et al., 2006). At the beginning of the LIA (cooling of ∼ 1.5 ∘C and reduced precipitation, e.g., Kilian and Lamy, 2012; Schimpf et al., 2011), the peak intensities of Pb and Y decrease abruptly and then persist with very low concentrations throughout this cold phase. Se shows peak intensities with periodicities of 500 years that coincide with phases of elevated global solar irradiance (Fig. 3b, c). This is consistent with findings of Lamy et al. (2010) and Kilian and Lamy (2012), who have argued that this wind-driven variability of sea spray input is closely linked to changes in SWW strength and associated stormy phases in the course of Late Holocene variations in the South Pacific Ocean climate system and sea surface temperatures. Between 2.5 and 0.7 kyr BP the pattern of Pb, Y and Se in the MA1 stalagmite (Fig. 3a, b) indicates that in this period, renewed peat formation was stimulated by a slightly warmer and more humid climate (Lamy et al., 2010) combined with a higher nutrient availability due to sea spray fertilization (e.g., Broder et al., 2015). At that time, frequent storm events with intense precipitation (Schimpf et al., 2011) and subsequent water table fluctuations may have led to an increasing DOC release from terrestrial sites. Thus, it is also expected that the peat surface layer underwent pronounced changes during this climate period. Peat accumulation may have been significantly enhanced by sea-spray-induced buffering of soil pH (Kilian et al., 2013) in the MA catchment after the long-term acidification caused by the 4.15 kyr cal BP Mt. Burney tephra fallout (Kilian et al., 2006). Based on the uranium record (Schimpf et al., 2011) and the Al ∕ K ratio (reflecting extreme chemical weathering, according to Miriyala et al., 2017) of the MA1 stalagmite (Fig. 3d), initial intensive alteration of the 10 cm thick tephra layer is assumed to proceed for more than 1000 years. The possible peat decomposition due to high tephra loading (e.g., Hughes et al., 2013) was likely accompanied by a decrease in DOC export (see Y and Pb, Fig. 3a). Furthermore, the observed variations in peat accumulation and/or degradation are well correlated with Late Holocene changes in peat forming plant species (e.g., Astelia, Cyperaceae) in several regional pollen records (Kilian et al., 2006; Lamy et al., 2010; Kilian and Lamy, 2012). However, the abrupt decline of DOC-bound trace element concentrations in the MA1 stalagmite indicates that distinct changes in the regional climate during the LIA seem to have a similar control on the peat ecosystem as the 4.15 kyr cal BP Mt. Burney eruption (Fig. 3a). Our preliminary results indicate that Holocene soil formation of Histic Podsols in the Magellanic moorlands has been influenced by specific changes in hydrochemical conditions and sea-spray-derived nutrient supply with regard to SWW-related climate variations and high tephra loading. 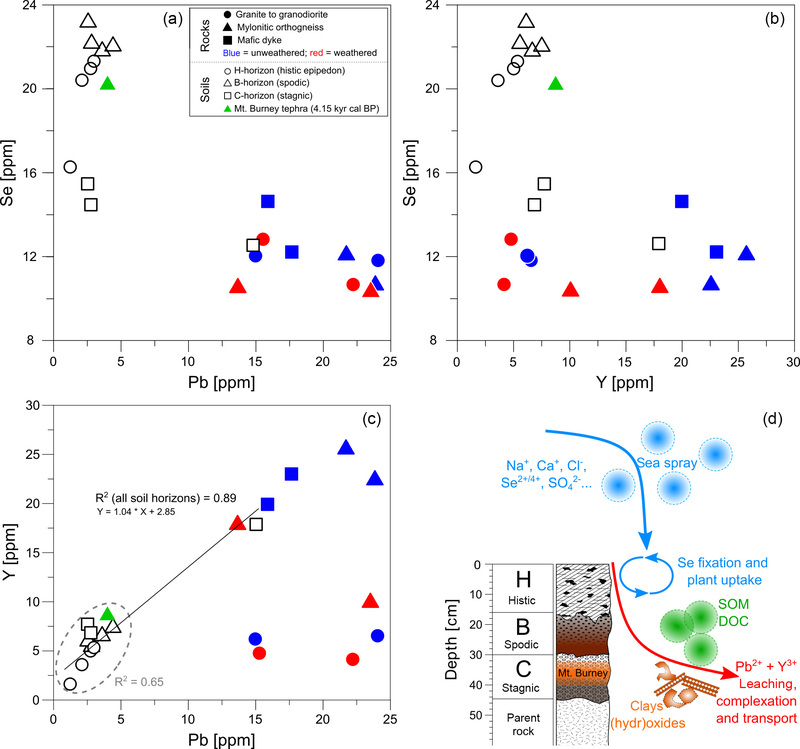 New insights into the leaching behavior of hardly soluble Y and Pb in these peaty soils and their application as paleoenvironmental proxies for DOC-bound transport can constrain peat accumulation and/or degradation in the MA1 stalagmite. Moreover, Y concentrations of MA1 may still reflect rainfall intensities since extreme high precipitation also leads to elevated DOC export rates from peatlands, especially during distinct Holocene storm periods (e.g., between 2.5 and 0.7 kyr BP). Since peatlands represent an important source of OC and trace element fluxes to nearby aquatic systems (e.g., Birkel et al., 2017), such as fjords in high latitudes globally (Smith et al., 2015), the sensitivity of these highly vulnerable ecosystems (e.g., Whittle and Gallego-Sala, 2016) to exogenic forcing factors (e.g., climate impacts and volcanic fallout) should be investigated further in superhumid southernmost Patagonia. This includes the quantification of past and present organic fluxes from peatlands to estuarine environments in combination with its linkage to the cyclic behavior of element transport to understand the implications of these processes for the terrestrial nutrient supply to marine biochemical cycles in fjords (e.g., Ríos et al., 2016). The data presented here are archived in the PANGAEA database (https://pangaea.de). Francisco Ríos (University of Trier) and Tobias Sauter (University of Erlangen-Nuremberg) are acknowledged for their participation in field work during the 2015 austral winter expedition with RV Gran Campo II. Oscar Baeza-Urrea (University of Trier), Petra Ziegler (University of Trier), Klaus Simon and Jakob Rauscher (both University of Göttingen) are thanked for technical assistance and analytical support. Furthermore, the anonymous reviewers are thanked for their comments that helped to improve the quality of the manuscript. Birkel, C., Broder, T., and Biester, H.: Nonlinear and threshold-dominated runoff generation controls DOC export in a small peat catchment, J. Geophys. Res.-Biogeo., 122, 498–513, https://doi.org/10.1002/2016JG003621, 2017. Broder, T., Blodau, C., Biester, H., and Knorr, K. H.: Sea spray, trace elements, and decomposition patterns as possible constraints on the evolution of CH4 and CO2 concentrations and isotopic signatures in oceanic ombrotrophic bogs, Biogeochemistry, 122, 327–342, https://doi.org/10.1007/s10533-014-0044-5, 2015. Casanova, M., Salazar, O., Seguel, O., and Luzio, W.: The Soils of Chile, Springer World Soils Book Series, Dordrecht, the Netherlands, https://doi.org/10.1007/978-94-007-5949-7, 2013. FAO: World reference base for soil resources 2014: International classification system for naming soils and creating legends for soil maps, World Soil Resources Reports, 106, Rome, Italy, 2015. Fröhlich, C.: Evidence of a long-term trend in total solar irradiance, Astron. Astrophys., 501, L28–L30, https://doi.org/10.1051/0004-6361/200912318, 2009. Hartland, A., Fairchild, I. J., Lead, J. R., Borsato, A., Baker, A., Frisia, S., and Baalousha, M.: From soil to cave: Transport of trace metals by natural organic matter in karst dripwaters, Chem. Geol., 304–305, 68–82, https://doi.org/10.1016/j.chemgeo.2012.01.032, 2012. Hughes, P. D. M., Mallon, G., Brown, A., Essex, H. J., Stanford, J. D., and Hotes, S.: The impact of high tephra loading on late-Holocene carbon accumulation and vegetation succession in peatland ecosystems, Quaternary Sci. Rev., 67, 160–175, https://doi.org/10.1016/j.quascirev.2013.01.015, 2013. Kilian, R. and Lamy, F.: A review of Glacial and Holocene paleoclimate records from southernmost Patagonia 1 (49-55∘ S), Quaternary Sci. Rev., 53, 1–23, https://doi.org/10.1016/j.quascirev.2012.07.017, 2012. Kilian, R., Biester, H., Behrmann, J., Baeza, O., Fesq-Martin, M., Hohner, M., Schimpf, D., Friedmann, A., and Mangini, A.: Millennial-scale volcanic impact on a superhumid and pristine ecosystem, Geology, 34, 609–612, https://doi.org/10.1130/G22605.1, 2006. Kilian, R., Lamy, F., and Arz, H.: Late Quaternary variations of the southern westerly wind belt and its influences on glacier extend, denudation as well as terrestrial and aquatic ecosystems within the southernmost Andes, German Journal of Geosciences, 164, 279–294, https://doi.org/10.1127/1860-1804/2013/0027, 2013. Lamy, F., Kilian, R., Arz, H., Francois, J., Kaiser, J., Prange, M., and Steinke, T.: Holocene changes in the position and intensity of the southern westerly wind belt, Nat. Geosci., 3, 695–699, https://doi.org/10.1038/NGEO959, 2010. Li, Z., Liang, D., Peng, Q., Cui, Z., Huang, J., and Lin, Z.: Interaction between selenium and soil organic matter and its impact on soil selenium bioavailability: A review, Geoderma, 295, 69–79, https://doi.org/10.1016/j.geoderma.2017.02.019, 2017. Miriyala, P., Sukumaran, N. P., Nagender Nath, B., Ramamurty, P. B., Sijinkumar, A. V., Vijayagopal, B., Ramaswamy, V., and Sebastian, T.: Increased chemical weathering during the deglacial to mid-Holocene summer monsoon intensification, Nature Scientific Reports, 7, 44310, https://doi.org/10.1038/srep44310, 2017. Ríos, F., Kilian, R., and Mutschke, E.: Chlorophyll-α thin layers in the Magellan fjord system: The role of the water column stratification, Cont. Shelf Res., 124, 1–12, https://doi.org/10.1016/j.csr.2016.04.011, 2016. Schimpf, D., Kilian, R., Kronz, A., Simon, K., Spötl, C., Wörner, G., Deininger, M., and Mangini, A.: The significance of chemical, isotopic, and detrital components in three coeval stalagmites from the superhumid southernmost Andes (53∘ S) as high-resolution palaeo-climate proxies, Quaternary Sci. Rev., 30, 443–459, https://doi.org/10.1016/j.quascirev.2010.12.006, 2011. Smith, R. W., Bianchi, T. S., Allison, M., Savage, C., and Galy, V.: High rates of organic carbon burial in fjord sediments globally, Nat. Geosci., 8, 450–454, https://doi.org/10.1038/ngeo2421, 2015. Vermeire, M.-L., Cornu, S., Fekiacova, Z., Detienne, M., Delvaux, B., and Cornélis, J.-T.: Rare earth dynamics along pedogenesis in a chronosequence of podzolic soils, Chem. Geol., 446, 163–174, https://doi.org/10.1016/j.chemgeo.2016.06.008, 2016. Wen, H. and Carignan, J.: Ocean to continent transfer of atmospheric Se as revealed by epiphytic lichens, Environ. Pollut., 157, 2790–2797, https://doi.org/10.1016/j.envpol.2009.04.021, 2009. Whittle, A. and Gallego-Sala, A. V.: Vulnerability of the peatland carbon sink to sea level rise, Sci. Rep., 6, 28758, https://doi.org/10.1038/srep28758, 2016.